If you're afraid you're not sharing enough of your daily activities with your online friends, here's another chance to get social…with books. 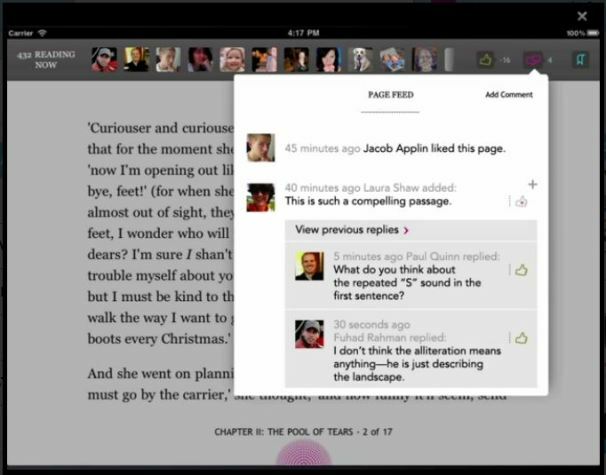 E-reader manufacturer Kobo has announced an expanded social networking platform that provides real-time feedback--the social "pulse," if you will--of the ebook you're reading. I know this all sounds a bit vague. Maybe some examples will help. Let's say you're engrossed in a Kobo book. 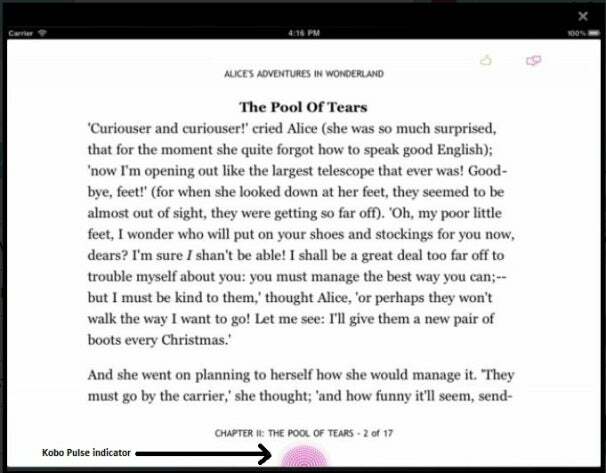 At the bottom of the screen, the Kobo Pulse indicator grows brighter or dimmer depending on the amount of online buzz related to the page you're on. To see more statistics about your book, including the number of people who like it, drag the Pulse Up. You can share passages with your Facebook friends and Twitter followers too. Kobo Pulse is free, and will first appear in Kobo's eReading App for iPhone and iPad. Soon after, it will extend to Android, Kobo eReaders and other platforms. The new Facebook integration will roll out over the next few months, the company said. "With Kobo Pulse we are capturing the zeitgeist of every book in the world, and enabling readers to be a part of it, to contribute to the life of the book, while reading," said Kobo CEO Michael Serbinis in a statement. I'm not exactly sure what he means, but any quote with the word "zeitgeist" is worth repeating. I'm also not sure if instant access to social networks improves or impairs the reading experience. If you're enjoying a book, do you want to stop and interact with fellow readers? Some people will, of course, and for them Kobo Pulse is probably a good thing.